Become a practice management guru. 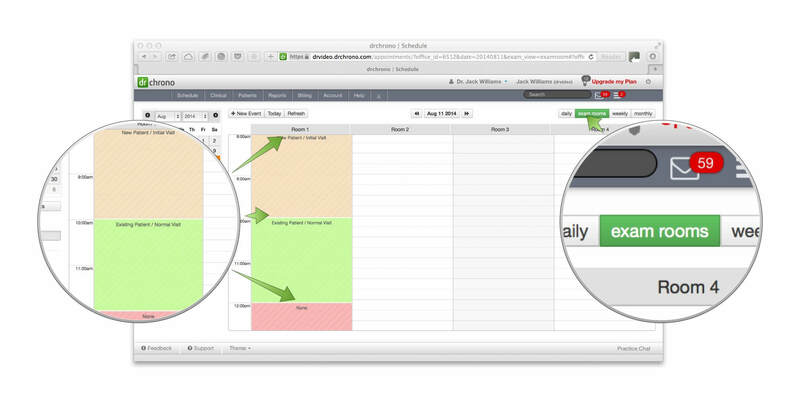 Learning how to manipulate the drchrono practice management schedule is a skill, the more you learn the more powerful it becomes. So today I wanted to talk about some features that are not widely used, BUT can make a world of difference for larger practices that have many doctors and many staff members. The schedule is used as mainly a communication tool, allowing everyone to know the physicians schedule. Today the main focus is on appointment templates and appointment profiles. Many of our users don’t understand the difference, do you know what the difference is? If you don’t that is ok, but if you don’t and want to know how to leverage these both, keep reading to learn how to appointment templates and profiles in your practice! 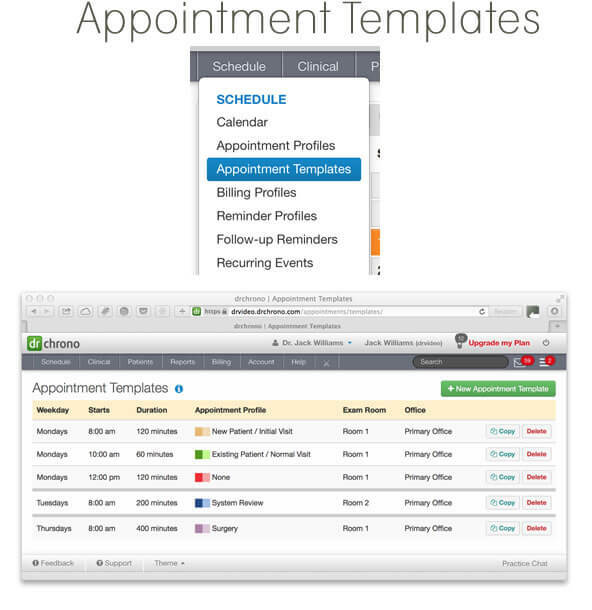 Appointment profiles focused on patients, what is the patient coming in for? You can apply a patient profile to the patient appointment, it will automatically load the duration time of appointment, a reason for visit, a billing profile and connect forms the patient has to fill out. 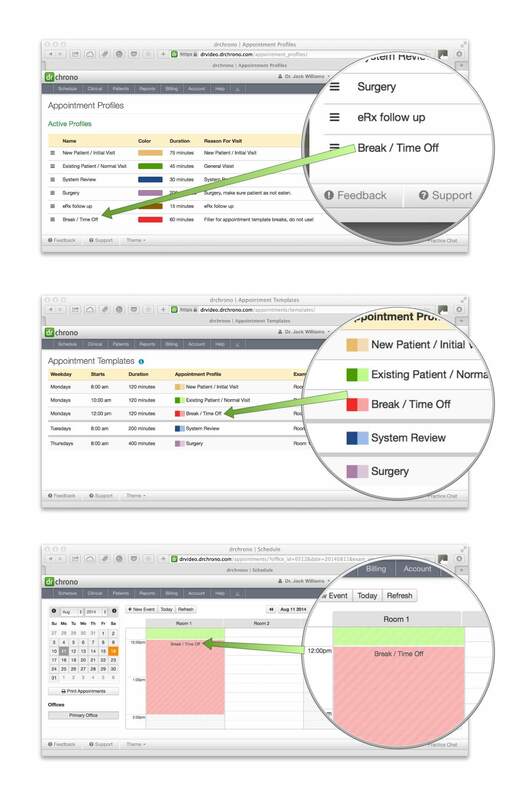 So for example if a patient is coming in as a new patient or an existing patient, the time of visit, the reason text field and billing profile are automatically set for you. I would highly recommend setting up every type of patient encounter in appointment profiles, it will save the practice hours and hours of time. Set these up before setting up Appointment Templates. 12pm – 2pm to break – you can even designate breaks though appointment templates! Creating a appointment templates are the way to go to organize your day, you can see this designation in the “Exam Room” view, only! So please be sure to click on “Exam Room” view to see these designations. 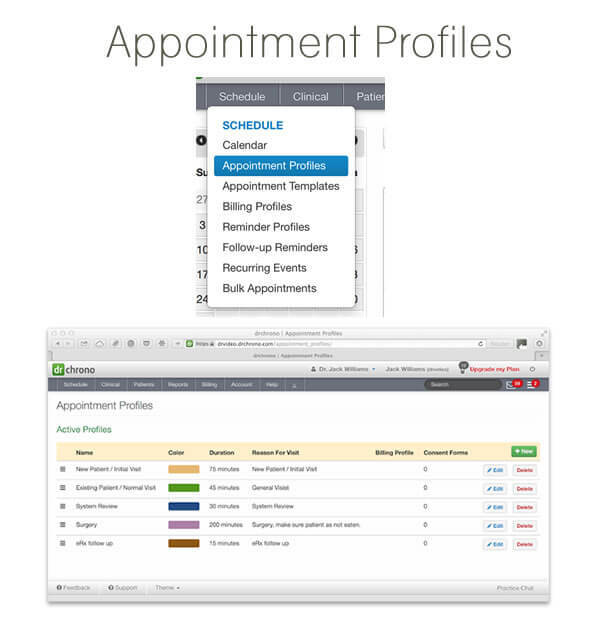 Appointment templates require an appointment profile, so these should be setup AFTER appointment profiles. Take a look here at how they work! This is them in action, you can see all of the designated times for specific types of patients to come in. You can use appointment templates to designate days your are not available to your staff, for example if you are off every Thursday, you can create an appointment profile called “Day Off”, set it up as a profile for the whole day, then create an appointment template that fills the whole Thursday and pick the day off profile for it.